This Halloween Mega Novelty Toy Assortment is perfect for Halloween party favors or Trick or Treat and it's only $12.95! Plus is it eligible for FREE shipping on orders over $25. Celebrating Halloween has never been so much fun! This mega Halloween Toy assortment includes the bestselling and most liked party favors at bulk price! The Halloween rubber ducks are the perfect way to spook up your Halloween party. These rubber ducks make a great Halloween party favor and alternative trick or treat toy! 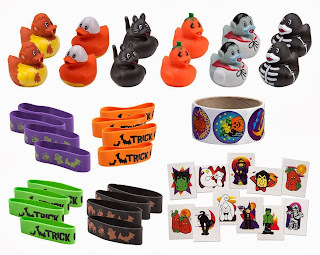 Sticker Roll; Includes 100 1 1/2" Stickers; A variety of Halloween themed stickers on a roll. Use them to decorate and to enjoy!